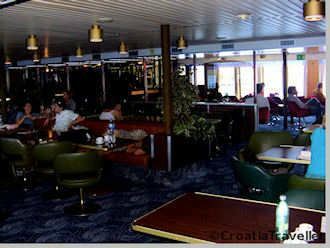 The bar/lounge on the "Marco Polo"
Jadrolinija is Croatia's national ferry company. Founded in 1947 to connect Croatia's islands with the mainland, Jadrolinija currently operates a fleet of 56 ships including 37 local ferries, 8 catamarans, 1 hydrobus and 5 regular ships. There are up to 500 daily departures in the summer, with about half that off-season. Jadrolinija schedules are pubished at the beginning of the year but there are often changes throughout the year. The summer schedule runs from the last few days of May or beginning of June to the last few days of September or beginning of October. There are often additional departures in July and August and sometimes in June and September as well. The winter schedule starts at the end of September and runs to the end of May and includes the special schedules for the holiday period. It's not unusual for one route to have three and sometimes four different schedules! Jadrolinija has three price categories: low season, high season and weekend prices for international routes. There is now a substantial penalty for weekend travel from Ancona to Split and Zadar and Bari to Dubrovnik. On domestic services there is no weekend penalty. There's a 50% reduction for children from 3 to 12 (children under 3 travel free) and there's a 20% reduction on the return portion of a round-trip ticket. All local and international car ferries and local catamarans can now be booked online. Click here for online Jadrolinija booking. There are Jadrolinija offices in all coastal and island towns that have a ferry connection. In other places, tickets are handled by local travel agencies. 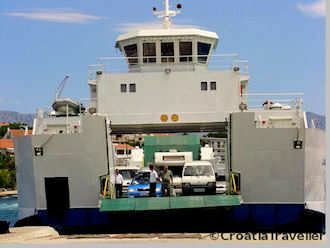 See more about booking Croatia ferries. It's important to note that purchasing a ticket for a car ferry does not reserve a place for your car. You must queue up anywhere from one to three hours before boarding in order to be assured of a place. Any Jadrolinija office will inform you of the advised waiting time depending on the departure. With such a vast fleet, it's logical that on-board services vary from very basic to quite comfortable if not luxurious. The newer the ship, the more comfortable and modern the on-board experience. Generally, the most comfortable experience is on the international routes. The most heavily travelled domestic routes usually get the best ships. Get more details about Jadrolinija on-board.